As per the tradition, the deity in Sabarimala, Swami Ayyappa, is a Naishtika Brahmachari, the one who observes staunch celibacy. 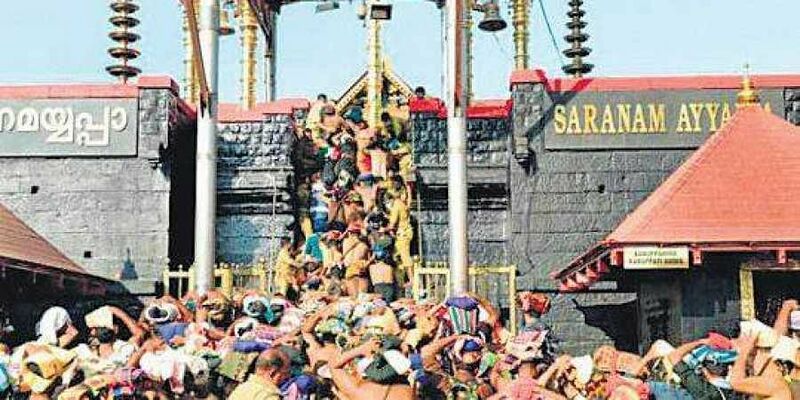 The Supreme Court of India is hearing a petition seeking entry of women of all ages to the famous Sabarimala shrine in Kerala. The observations of the court during the hearings that women have the constitutional right to enter the temple and pray like men without being discriminated against has given rise to a countrywide debate. The court was hearing the PIL seeking the removal of traditional entry ban of women between 10 and 50 years of age. By the time this article appears in print, the Supreme Court would have perhaps given its iconic judgment in this matter. As per the tradition, the deity in Sabarimala, Swami Ayyappa, is a Naishtika Brahmachari, the one who observes staunch celibacy. Malikapurathamma is the eternal lover of Ayyappa who is waiting for the Lord to marry her. Ayyappa has promised to break his celibacy to marry her in the year when there will be no new devotee visiting the holy shrine. The traditionalists bring forth various arguments to justify the continuing ban. One is that 41 days of penance is required for all the devotees to visit the shrine and women will not be able to observe the same due to menstrual impurity. The second is that as the presiding deity is a Brahmachari, women of reproductive age should not enter the temple. Another argument put forth is that it is the ‘Will of God’ which is known by the ritual called Devaprashnam. In this, astrologers will interpret the will of God and as per the various ‘Devaprashnams’, Swami Ayyappa doesn’t will the entry of the women of reproductive age to his abode. Another argument is the journey to the hill shrine in Periyar National Park is perilous and the tradition was started to protect the women from the difficulty. Such arguments do not stand a chance against the rationality of the Constitution. Ayyappa is considered as the Avatar of Dharma Sastha. In Skanda Purana, the name Sastha appears as the son of Mohini, the female avatar of Lord Vishnu and Lord Shiva. Dharma Sastha is not a Brahmachari, but has two wives, Poorna and Pushkala. Ayyappa is the yogic avatar of Dharma Sastha. The legend of Ayyappa is of relatively recent origin whereas Dharma Sastha legend is from the time immemorial. There is no restriction for women of any age in most Dharma Sastha temples. The argument that Lord Ayyappa’s celibacy will be disturbed if women devotees visit the shrine is an insult to the concept of Ayyappa’s Brahmacharya and Malikkapurathama’s divine love. Many male devotees visit the shrine without the mandatory 41-day penance like non-consumption of alcohol, non-vegetarian food etc when visiting Sabarimala Temple. It is assumed that men would follow the tradition just because they choose to visit the temple. It is strange that no such trust is placed on women regarding their menstrual cycle. Besides, menstruation is a natural process like other bodily function. It is hard to imagine the all-knowing supreme deity would find a natural process to be impure. For argument sake, if one says it is traditional to consider menstruation impure, one can confidently say no Hindu woman devotee would visit any temple, let alone Sabarimala when she is having her menstrual cycle. The argument of the ardent trek to the shrine falls flat when we know that children below 10 and women over 50 can handle the trek without much difficulty. Devaprashnam is a subjective interpretation by priests about ‘God’s will’. It is rare that any priest has agreed for any social reform. Stronger arguments were presented when Hindu code bill was discussed, but the entire society benefitted when our Constitution chose rationality over opinion of priests. The temple entry proclamation also was a decision by the government. Given a choice, no tradition would change by itself. This is true about any religion. The chances of the apex court allowing entry of women to Sabarimala Temple are high based on the Constitution and common sense. It would be a progressive step. In the first few years after the verdict, the devout women may hesitate to go to the temple, while the euphoric nonbelievers may rush to make a point about the easy victory achieved for women empowerment. Slowly, the devout women too would start visiting the temple while the vociferous feminists would have gone in search of other easy victories and softer targets. Entry of women to Sabarimala is not the temple entry proclamation, banishment of Sati or the Hindu code bill to make any significant change in the society. It is not even the Shah Bano verdict that got martyred at the altar of appeasement politics. The reform, like many other radical changes, will be absorbed by the Hindu society without much trouble. After a few years, no one may bother when women and men pray together in Sabarimala. One more temple would get a bigger queue for darshan and the temple coffers would overflow more rapidly. The author has displayed his ignorance about the reason for the prevailing rule. There is a concerted effort to westernise and dilute Hinduism and the author is a victim of such forces. We all pride to claim that the essence of Indian democracy is its character of “unity in diversity” and this very diversity emerges from the very diverse customs and traditions inherent in Hinduism whic is absent any other faith if taken independently. Please do not kill that diversity and convert Hinduism to one similar to other faiths. This urge to “ modernise” Hinduism stems out of the servitude to the western culture - people think that every Indian tradition is crude and we should follw the western culture. The author appears far detached from the real problem. He is trying to find a rational explanation for the irrational. The very concept of belief in God is outside the realm of rational thinking. How can you fix God which or who is irrational into the Constitutional rationale? "No reform, religion, piety, tradition or revolution have stood against the power of commerce ever" Perhaps this one simple sentence defines everything that has happened and shaped our society, post Vedic period. Thanks once again Anand Neelakantan.